Federal study finds warming is main polar bear threat. In tweet, Trump denied this. On Monday, the U.S. 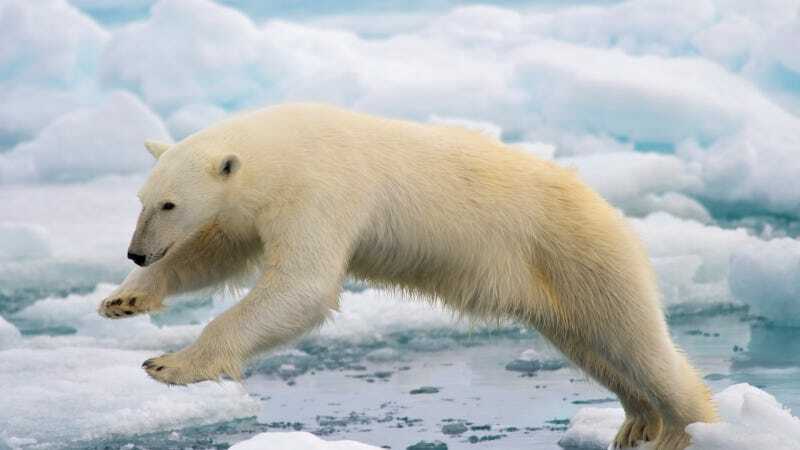 Fish and Wildlife Service released a major new report concluding that human-driven global warming is the biggest threat to polar bears and that if action isn’t taken soon the Arctic bears could be in serious risk of extinction. “It cannot be overstated that the single most important action for the recovery of polar bears is to significantly reduce the present levels of global greenhouse gas emissions,” the officials wrote in the report, which is required under the Endangered Species Act as part of a conservation plan for the bears, which were listed as threatened in 2008. Not to get too involved in Trump Twitter analysis, but the three years since Trump made that odd tweet have all been the hottest on record. So…global warming is…here? Arctic sea ice area and volume have collapsed in recent decades. And the North Pole has been freakishly warm this winter, as carbon pollution has made what would have been once-in-1,000-years heatwaves increasingly commonplace. But what’s so remarkable about this year is that the ongoing drop in Arctic sea ice has been matched by an unexpectedly sharp drop in Antarctic sea ice. The area of the Arctic covered by sea ice in October and November 2016 was the lowest on record for those months since recordkeeping began in 1979. The current global polar bear population is estimated to be 26,000. If greenhouse gas emissions continue to rise at the current rates throughout the 21st century, polar bears will likely disappear from much of their present-day range. While the number of polar bears in the southern Beaufort Sea—one of two U.S.-based populations—has decreased over the last decade, to about 900 bears from about 1,500 in 2006, it's true that global polar bear numbers have increased in recent decades as hunting protections have dramatically improved. However, polar bears rely on sea ice as a platform to hunt ice seals and to raise their young, and as this ice diminishes across the cold regions of the planet, polar bears will have a harder and harder time surviving even if they aren't being hunted to extinction. It now ironically falls to some degree on Trump’s shoulders to help keep polar bears alive in healthy numbers—and there isn't much to feel good about. As Cabinet hearings for Trump’s team begin this week, climate activists and environmentalists are dismayed at the dismal record on environmental issues and outright climate change denial of several key picks, including head of the EPA Scott Pruitt, Energy Secretary Rick Perry, and Secretary of Interior Ryan Zinke. Trump’s pick for Secretary of State, former head of multinational energy company ExxonMobil Rex Tillerson, is not a climate change denier, but he’s been in charge of a company that desperately wants to drill for oil in the Arctic, so polar bears are probably not his main concern. Trump has also threatened to abandon the U.S. commitment to the Paris climate agreement. As for the near and mid-term, Alaska appears to be heating up at a faster rate than the rest of the planet, an element of global warming true of many polar regions. Last year was Alaska's warmest on record by far. Aside from calling for a reduction in global greenhouse gas emissions, the USFW plan also focuses on reducing human-bear conflicts, collaboratively managing subsistence harvest, protecting habitat, and minimizing the risk of contamination from oil spills.